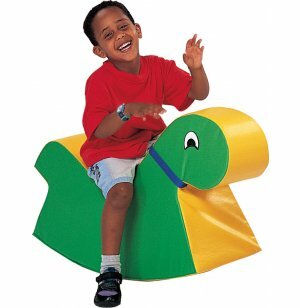 Toddlers love rocking toys, and the Big Green Rocky rocking horse from Children's Factory is no exception. The soft rocking motion and lovable design will endear this rocking toy to little riders, right from the start. 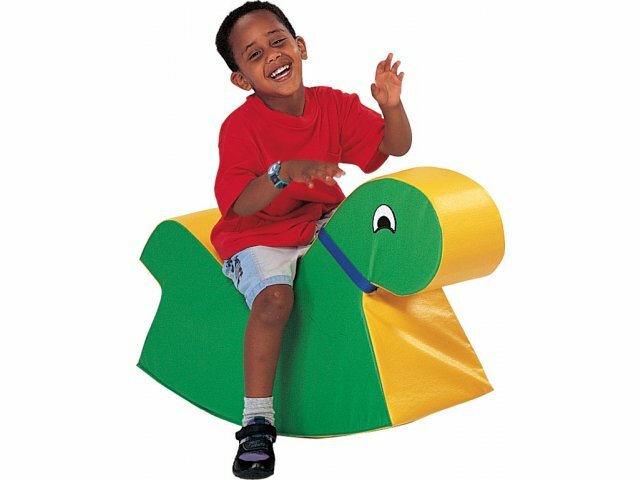 This soft rocking horse is made of a solid foam core covered in nylon–reinforced vinyl for a toy that is both deliciously soft and highly durable. The bright colors and adorable design appeal to children, and the easy wipe–down surface and low maintenance appeal to teachers and caregivers. This rocking horse is uniquely safe and comfortable, with no hard edges and a cantilever base that prevents tipping. Perfect for preschools, daycare centers, waiting areas and more, this adorable rocking horse is so much fun, you might just need more than one. Comfortable:Solid foam core is gentle and soft, making this rocking toy especially comfortable. Extra–Durable: 14 oz., nylon–reinforced vinyl is highly resistant to tearing. Easy–to–Clean: Vinyl surface wipes down easily for low maintenance and maximum hygiene. No–Tip Base: Cantilever base provides a wide support that prevents tipping. Fire–Safe: All Children's Factory products adhere to California Fire Code Requirements.